If you follow your mom’s advice and wash your hands before every meal you’ll likely lather up tens of thousands of times in your life, but the plumbing essentials that enable your habit are rarely considered with the appreciation they deserve. The faucet, like its fellow hard-working and reliable bathroom buddies the toilet and the shower, is a fixture that gets a whole lot of action but very little love. 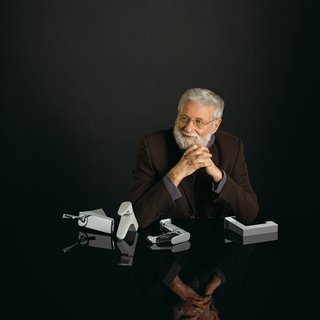 Cognitive scientist, design consultant, and avid "everyday thing" enthusiast Don Norman shares with us his passion for these practical pieces and outlines the tenets that matter most when choosing your faucet. "There are only two things you care about besides the appearance," he explains. "The amount of water coming out and the temperature." This seemingly simple balance between image and duty is one that Norman understands implicitly. As an engineer his priority is making sure things operate properly, but as a psychologist he argues that there’s more to functionality than, well, functioning. "Emotions are really the most important part of life. Things have to work well, but they also should excite you." With that in mind we check out the curves, handle the handles, and lift the levers to deter-mine which lavatory taps are tops. If you've long loathed your leaky faucet, this is your chance to gracefully drop the drip. Professor Donald Norman offers his expert opinion on what makes a spectacular tap.